Photo by Annette Ashton Mike Wallau and Gary Burke are neighbors, but although they both grew up in Midtown they don't live on the same street. They share a prominent building together as the owner of Mike's Café Etc. and Peninsula Hardware, respectively. Although they didn't know each other growing up in the 50s and 60s, both remember the area as full of orchards with Eddy's Café and Toy World, the Quonset hut that was Purity Supreme, and California Paint and Wallpaper on Middlefield. Each in his own way has kept the one on one with customers we remember from back then. They share a commitment to knowing and valuing their customers and treating them like neighbors. Mike took over Joanie's Country Fare more than eight years ago and worked for 20 hours a day to get Mike's Café Etc (Etc stands for wife Ellen, and daughters, Taylor and Chelsea) up and running in less than two weeks. The time was another of Silicon Valley's famous downturns and Midtown was a bleak area. He bought the restaurant with a pledge of monthly payments to its owner because he knew Midtown and believed in it. He needed to be profitable as soon as possible, and after the first week he was. He knew the business and knew what it took to be a success, having worked at just about every restaurant job from busboy at L'Auberge to head waiter in his career, the last spot being Il Fornaio. His formula of a quality product, good service and a fair value has been bringing Midtown residents and non-residents in ever since. Now, Mike's Café will have a sister restaurant when Mike opens his second eatery further down Middlefield in Menlo Park, at Willow, at the end of October. It will be open, beginning with breakfast, seven days a week. 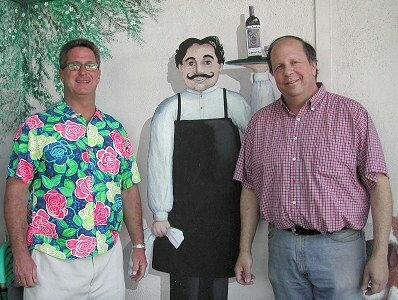 And Mike and his dad will continue to personally greet customers. Gary remembers working with his dad, Allen, at the hardware store after his classes at Cubberley High School. His dad bought the store from its original owner in 1964. Peninsula Hardware itself has been around for more than 50 years, first opening in 1953. In those days, things like bottle cappers--devices that put caps on bottles--washtubs (which he still carries) and meat grinders were big sellers. Today, it is mechanized gadgets and purple plastic plungers or plumber's friends for the toilet. I know a lot of people by their face, says Gary, who considers himself lacking the gift of gab he admires in Mike. Yet he easily understands what a customer needs who brings in this thing that goes on the end of the kitchen faucet and makes the water come out faster and harder. From front to back, the store is neatly filled to overflowing with what his customers need and what they ask him for. Yet still more gadgets and gizmos, such as long lengths of plastic conduit are tucked away out of sight.